Last night I had a vivid nightmare. In this lucid (partially waking) waterfall of subconscious fears I had rented my home to a close friend. I’d done this in the hope that it would be looked after in my absence. I can’t remember where it was that I’d gone or indeed how long I’d been away for – but when I returned my friend had hired an unskilled private contractor to dig down into my garden and undermine the foundations of my house. When I arrived for a visit my friend didn’t mention to me that anything had changed and left me to find out for myself that the underbelly of my home had been exposed. It was now propped up only by three slender, insubstantial concrete piles. Wires, plumbing and broken floorboards were dejectedly hanging down from holes in the floor above the freshly exposed soil around twenty feet below them. I felt betrayed by someone that I’d trusted implicitly, upset that the biggest asset in my life was in danger of total collapse and was suddenly faced with a new and uncomfortable reality. Now I’d seen my home from this unusual perspective I knew the fragile nature of its existence and how it could so easily be taken away from me. When I awoke I struggled for a moment to separate reality from my dreamscape. My first thoughts were about the betrayal by my friend. Why had they done this? What possible reason could there be for their behaviour? Didn’t they love me anymore? This one thought dogged me for the first few hours of my day – until (after going out for a walk to shake off the feeling) I continued reading a book I’m currently working through about a potential career direction and realised that I’d completely missed the point of the nightmare. My foundations are currently uncertain. They feel like they’ve been removed (by me) and I have the most important things in my life resting upon complete uncertainty. A lifelong friend has always referred to me as ‘risk averse’ – and this is certainly something that I’m happy to admit I’ve been in the past. I’ve always sought certainty over chance. I don’t normally gamble on anything and tend instead to go for courses of action where I have a fixed outcome presented to me. Today I realised that the inner me is terrified of what I’ve done to myself career wise. Suddenly I feel I’ve become a high stakes gambler, playing a game of chance with foundations that I had always viewed as solid and unchanging. Instead of being conservative I’m spinning a wheel of fortune to determine what will happen next. I used to ‘know’ who the old me was. He was above all else employed and because of this I felt he was dependable. I thought people viewed his ability to remain unchanged as reliable. I believed that this made him appear trustworthy. Now I’m having to re-assess how not only how I see myself but how I feel the rest of the world sees me. All my beliefs about who I am are once again being challenged and long held personal certainties seem as if they’re tumbling through the air like a juggler’s skittles. Whilst there is now infinite possibility in my life I have no experience at all in turning this looming uncertainty into something that is capable of helping me survive financially and this is conspiring to skew my perspective of my self worth, capabilities and sense of personal security. Today – totally out of the blue I’m feeling lost, alone and fearful. Every potential decision suddenly seems to carry a weight and consequence completely out of proportion with its reality. I’m bewildered over why today this fear has hit me in such a profound way – and honestly I want to return to my bed, pull the covers over and curl up in the dark. I’m determined not to though internet. I’m carrying on by walking, reading, writing my way through it. I just hope the feeling passes soon. I’m trying to tell myself that putting one foot in front of the other is enough, and that things will work out. 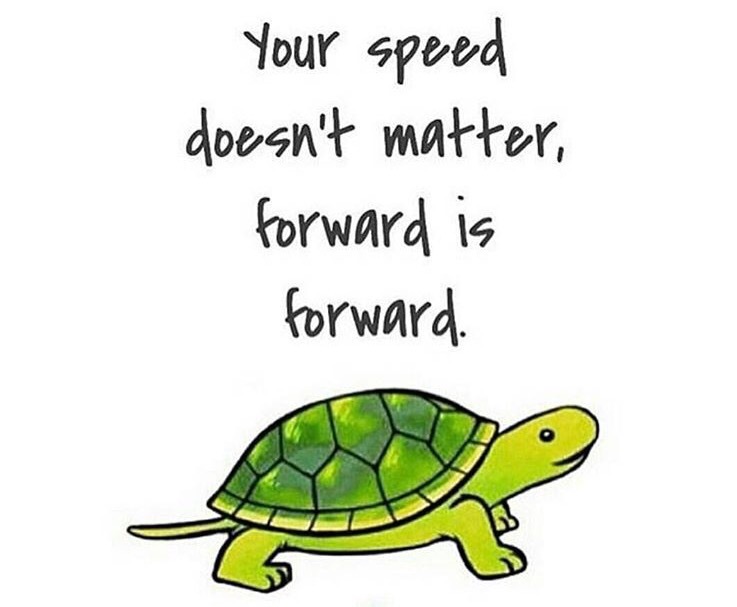 Hopefully at the moment forward IS forward and my speed in life doesn’t matter like I currently fear it does. What you are doing is scary, and that’s because it’s WORTH doing. When it came to your health nothing exciting ever happened in your ‘comfort’ zone and the same is true for other areas of life. For what’s it’s worth if someone asked me to name someone who is dependable and trustworthy, your name would immediately spring to mind even though I’ve never even met you, whether you’re employed or not. You can be those things without having a job, and I know that because you are living, twalking proof! Well change is scary. Definitely. And changing everything you know to go after something new, is one of the most scary things you can do. However, if you can obtain happiness then it is definitely worth the risk. In Holland we have a saying “fear is a bad councilor”. So, well done you for ignoring his advice and going after what you believe is worth doing. As scary as it is :). You Dutch people not only have great canals and windmills – you have excellent mottos as well! 😉 That’s why the quote tiles here are so freaking popular haha. Dave, all change (good or bad) can be stressful. I should know – I’m a psychologist, haha! You are going through so many changes in terms of your weight, lifestyle etc that it’s not surprising that you sometimes have these kinds of thoughts. Being employed or not does not define the type of person that you are. In my opinion having the courage to leave a job that makes you unhappy says a lot more about you. These feelings will pass, use the time to explore different options until you find something that makes you more content. Keep going, you’re doing fab!